This recent image of the Nevada desert is one of my husband’s favorites. The road in the foreground wanders into the foothills of the Humboldt Range to Star City, a former mining community and now a ghost town listed on the Nevada registry of landmarks. A couple of months ago when we stood here, we were awed by the view and the daunting prospect of entering those mountains. Today I came across a piece titled, “The Science of Awe” by Jake Abrahamson. Abrahamson quoted an article published in a professional journal in which researchers described awe as, “[i]n the upper reaches of pleasure and on the boundary of fear…” That phrase characterizes my overall vast experience of desert travel. Through my journeys it has become clear that a response of awe to nature yields beneficial effects–it stimulates the spirit and settles the mind. Awe is the antithesis of neuroses, an antidote for modernity and a portal to reverence and prayer. Awe provides an important perspective that every loving parent gives his child: you are many things, but among those is not the author of this wild and wondrous world. There is a certain sense of surrender that I enjoy with being made to feel small in this way. …[A] state of awe…psychologists are coming to understand, can have profoundly positive effects on people. It happens when people encounter a vast and unexpected stimulus, something that makes them feel small and forces them to revise their mental modes of what’s possible in the world. In its wake, people act more generously and ethically, think more critically when encountering persuasive stimuli…and often feel a deeper connection to others and the world in general. Awe prompts people to redirect concern away from the self and toward everything else. And about three-quarters of the time, it’s elicited by nature. It was only 11 years ago that psychologists Dacher Keltner of the University of California, Berkeley, and Jonathan Haidt, then at the University of Virginia, proposed awe as an emotion worth studying. “In the upper reaches of pleasure and on the boundary of fear,” they wrote in the journal Cognition and Emotion in 2003, awe is felt… Fleeting and rare, experiences of awe can change the course of a life in profound and permanent ways.” –Jake Abrahamson, “The Science of Awe,” Sierra Magazine: November-December 2014. What a beautiful photo, and I definitely believe that feeling an awe of nature is inspirational! Hello! I have been thinking of you recently.. I have link for you that I think you will find interesting.. I will have to come back to read this post, but it is good to hear from you..
That IS a beautiful photograph Vivien . We’ve travelled through a little of Nevada but more of Utah and Arizona, the landscapes certainly provoke *awe* of the description you mention. I love how Jake A draws on the emotions so well . Thank you, Poppy. I’m delighted to hear that you’ve visited those southwestern states. The dimensions alone of those deserts are enough to inspire awe, and I think the extraordinary colors there heighten the experience of it. 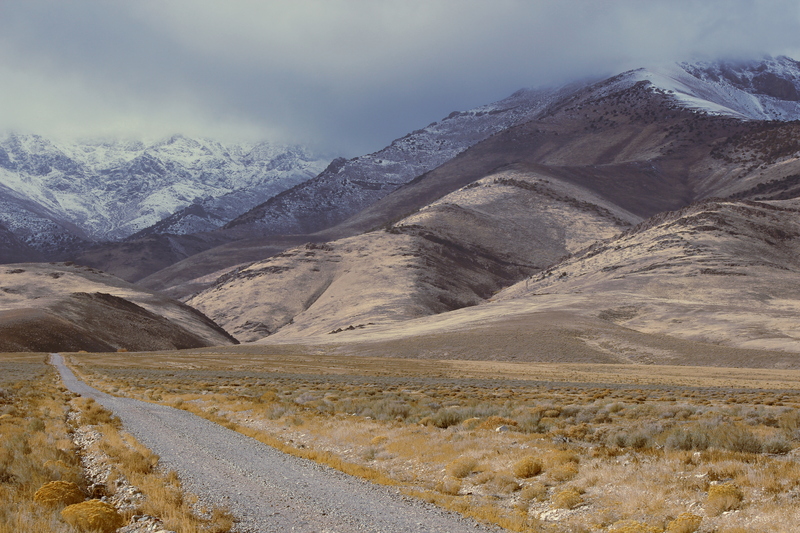 The colors of the northern Nevada desert are more subdued but its vastness at time borders on incomprehensible. I definitely agree with you on awe and wonder at the presence of this grandeur. It’s difficult to understand but one must feel it. It is fleeting but it leaves and indelible memory in our soul. What a glorious road you’re traveling. Hi Seeker, So nice to hear from you! We are indeed blessed to be traveling this desert road. “An indelible memory” does reflect the lasting impact of awe. I was fascinated to read that there is now scientific research to support what we have long experienced. I’m awestruck just by the photo, I’m sure the view in person is astounding. This type of landscape – deserts and mountains inspire an awe in me more than any other landscape. I’m not surprised that most awe is inspired by nature. Architecture and art have had the same effect at times – the buildings of Minsk, Belarus and the paintings of Salvador Dali come to mind. Fascinating post, Viv. I love that you included architecture and art in the genre of awe-inspiring. To my mind, too, they conform to the “upper reaches of pleasure” and “on the boundary of fear.” Although not inherently threatening, there is a certain intimidation that I experience when contemplating great works of art–particularly when I consider trying to recreate them. I, also, find deserts and mountains the most awe-provoking of landscapes. Thank you for your comment, Julie, it is always great to hear from you. Dali’s work definitely leaves me on the boundary of fear. It’s mesmerizing and impressive, but not something I’d hang on my wall. Love the angles that the different elements create in this beautiful image. The simplicity of it makes me think of the words: “in the nothing there is everything”. Ah yes, awe! Tis a wonderful thing. Wow.. so beautiful. You are very fortunate to be able to stand there, pause and think and feel alive and in nature. Love this picture. Hi Peter, Sorry for the long lapse. We are at home in California now and I am very much missing the desert, so thank you for bringing me back to this beautiful place and peaceful memory. I love the idea that awe results, in part, from realizing that we are not the creator of what awes us. It certainly has a spiritual element, doesn’t it. Thanks Vivian, for the reminder. Your sweet self-chiding is also spiritual, don’t you think? Thanks Vivian. I am delighted that you enjoyed the photo. Thank you for visiting and for such a lovely comment. Amen. Oh wow! I LOVE this….love the wilderness and the beauty of God’s creation….truly inspiring to me! Would love to live close to these incredible mountains. I stand in awe of God’s world and His creation…WB always laughs at me as I will say over and over WOW…that view or that landscape or those clouds or look at those mountains or I love the views of the desert, with lots of WOWS mixed in there too or I will get quiet as I am speechless! We have an incredible world to see if we will take the time to look up or out:) I love being outside in the elements and a great adventure is a wonderful cherished desert…as I shoot photos I am so excited when God gives me a cool storm or scenery or light to take a great photo. I truly love your blog and your photos! We definitely share a kinship when it comes to the wilderness and the desert. People often say to me, “The northern Nevada desert? There’s nothing out there.” I never tire of the repeating terrain features–to me, every moment, every mile, every mountain, meadow and plain, every turn of light, every breath of the wind, is something new to behold. Thank you for this beautiful comment and God bless you. Thank you kindly. Within the landscape, I loved the transitions from flowers to brown foothills to snowy mountains to the ominous sky. All in all, a mesmerizing desert scene. It certainly is a beautiful picture. Thank you very much, Bente. Vivian, this photo is admirably beautiful. I love your pictures so much ! It is so true that awe stimulates and uplifts the spirit and helps us to connect with our Creator. I realized recently that I need to go more often to these places that prompts such an emotion. And also to places I hold dear and which gives me a sense of well being. These places are not always grand vistas, most of the time they’re simply landscapes in the country or a beautiful country scene. In our modern busy lives it’s important to connect with nature and our soul at a deeper level. Thank you for another wonderful post. If I may – completely agree that nature does seem to feed the soul, but lets remember that the Creator is everywhere, so wherever you are, there He is. Jocelyne, I am so honored to have you as a loyal reader. This website is a labor of love and it gives me such a deep and profound sense of gratitude to connect with you here. I completely understand that sometimes even a simple scene provides a contemplative space and fosters peace and grace. There are so many ways to deepen our connection to spirit, we have only to desire and seek them. Thank you again for visiting, may you also have a beautiful week! Wie ich sehe hast du ein neues Design. Winter in Nevada! Grüße aus den Alpen. As I see you have a new design. Winter in Nevada! Greetings from the Alps. It truly is an amazing landscape and wonderfully captured. Thank you! I adore your blog, what a fascinating journey! You have many beautiful photographs on your site! Awe and awesome are often overused words, so it’s refreshing to read what you have written here. A genuine sense of awe encourages perspective and a little humility – natural landscapes do this for me! Thanks for taking the time to stop by OldPlaidCamper earlier, I appreciate it.